(CNN) -- A Russian heavy missile cruiser stopped three pirate ships off the coast of Somalia, and detained 10 pirates, according to a statement released Friday by Russian Navy headquarters in Moscow. 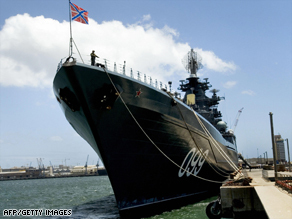 Russian missile cruiser "Peter the Great" moored in Cape Town, South Africa, last month. The cruiser, Peter the Great, halted two small high-speed motor boats and a mid-size, support vessel on Thursday, the Russians said. "Ten pirates have been detained. All of them are citizens of Somalia," the press release obtained by CNN stated. "Officials from the Northern Fleet's military prosecutor's office are currently questioning the detainees aboard the Peter the Great. Their future will be decided in coordination with the Russian Foreign and Justice ministries." The Russians said a Russian helicopter Ka-27, which took off from the cruiser, had located two small boats, which were moving toward an Iranian fishing vessel at high speed last Thursday. When those in the boats spotted the helicopter overhead, the boats began slowing down, then veered off toward their support vessel, which was adrift nearby. The helicopter crew could see pirates in the two motor boats throwing weapons into the sea, and kept chasing the boats until the Russian cruiser arrived in the area. "The three boats were (captured and) delivered to the Peter the Great, and ten Somalian pirates were taken aboard. "The detainees possessed weapons, including a G-3 rifle, an Ak-47, two AKMS machine-guns, two grenade-launchers and two anti-infantry grenades, and also had a GPS receiver, a ladder, 500 grams of drugs, a large amount of money, a bag of sugar and a bag of rice. The detained pirates were high on drugs," the press release said. Meanwhile, Somali pirates have released a Panamanian-flagged, Japanese-owned vessel that was hijacked in the Gulf of Aden in November, according to a non-governmental group that monitors piracy. The ship, named the MT Chemstar Venus, was released late Thursday, according to Ecoterra International. The 18 Filipino and five South Korean crew members were reportedly unharmed. The International Maritime Board, a group that also monitors piracy, told CNN that the company had not confirmed the release of the ship, but said shipping companies sometimes wait a few days before going public to ensure the safety of the crew. The ship was hijacked on November 15. It was unclear whether the pirates were paid a ransom to release the ship. This incident comes a week after Somali pirates released a Ukrainian ship carrying tanks, ammunition and crew after receiving a ransom of $3.2 million. -- CNN's David McKenzie contributed to this report.